Copyright: Entrants agree to have their submitted name displayed on our website and used by us for any purpose, at any time, without any fee or other form of compensation. Pictures of all pets are accepted. 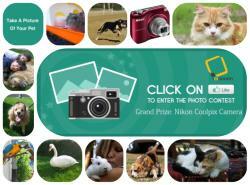 This imonomy Pic Your Pet Contest is dependent on skill, and creativity. The entrant may submit an unlimited number of entries.